The Hunter Douglas veneered wood ceiling system gives you the freedom to make a natural looking wall or ceiling design. They can be produced in any standard size up to 600x1200mm with bespoke sizes available on request. 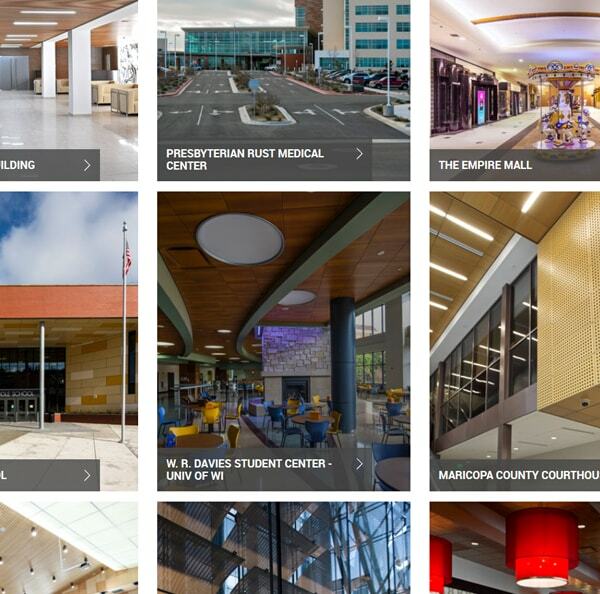 Depending on the required joint width and access requirements, there are four panel types available for ceilings and two available for wall systems. 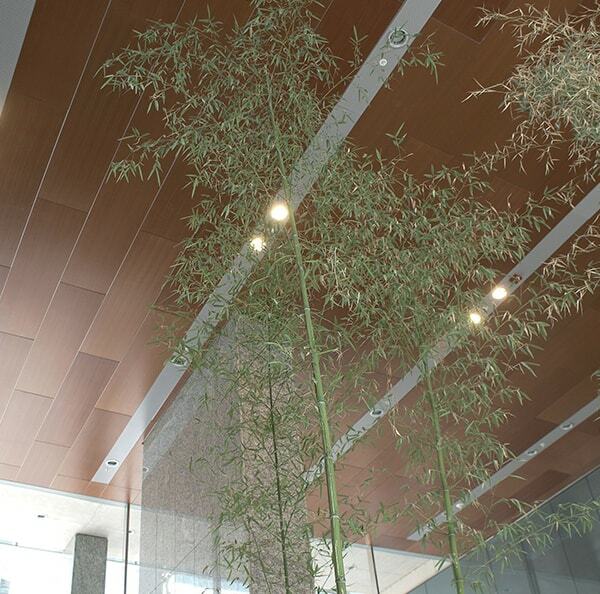 They are an environmental friendly ceiling and wall building product that offers endless design possibilities. Hunter Douglas wood ceiling tiles are made of an MDF core covered with a wooden veneer. They fix directly onto a substructure with the use of special metal clips, which can create a closed or open joint. The natural growth patterns of each tree can be clearly seen in the veneer, including natural characteristics such as knots and outgrowth. Once the veneer is chosen, the panels will be produced according to the lay out plan to ensure a perfect fit. Hunter Douglas offers four different demountable wood ceiling tile types - Classic, Modern, Prestige and System. They all have their own look, jointing system and advantages. Huge design variation is available between these systems but this can also be achieved through differing veneers, colours and panel finishes. 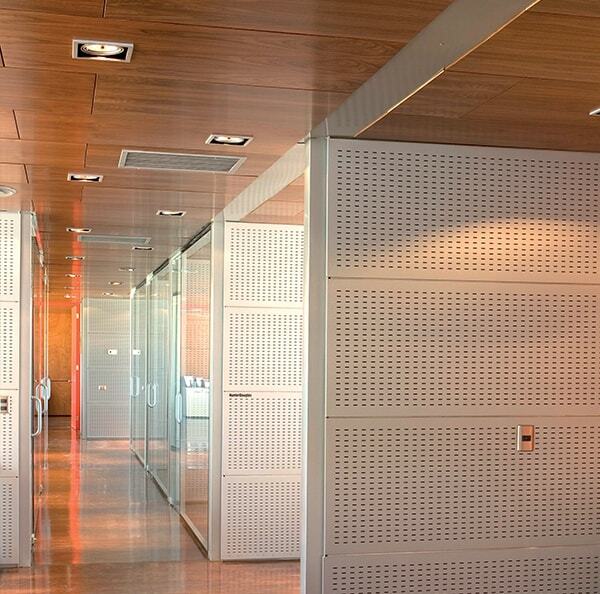 There is a wide scope of perforation patterns, which can be applied to all veneered panels. 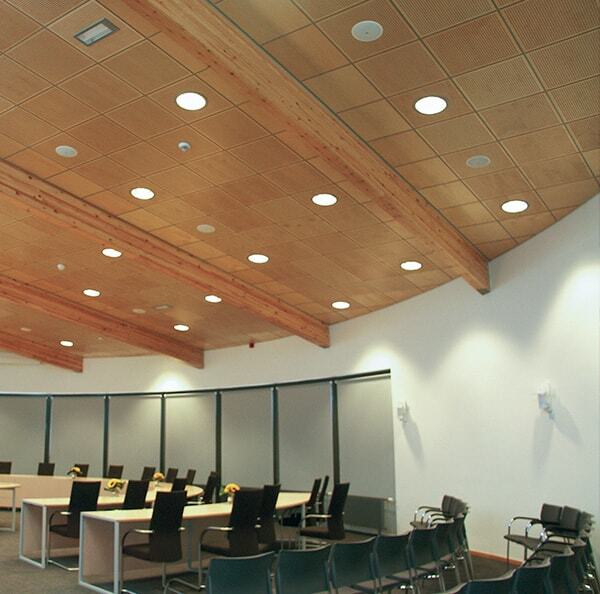 Depending on the type of panel perforation, a specific acoustical performance is achieved. Bespoke perforations are available as well as our standard varieties. We have recently developed a new perforation pattern that offers up to Alpha W 0.95 by creating 0.5mm diameter holes invisible to the naked eye. Our veneered systems exceed 40 veneers to create the ideal ambiance and feel. These panels are then provided with a transparent lacquer but if a special look is required, special varnishes, staining or paint finishes are also possible. Upon request it is also possible to slip-match or miss-match sheets. Depending on how the veneers are matched, a significant design is created. By impregnating wood, a reaction to fire classification (EN13501-1) of B-s1,d0 can be achieved. In some cases higher classifications can also be achieved. Be inspired on our project gallery with wood ceiling panels. Click on the photo for more information. Use the filters below to browse our full selection of Tiles & Panels Products.